If you want to correct his one instance, you choose the proper spelling from the list. But that fixes the word only once. Up pops a submenu containing various corrections. 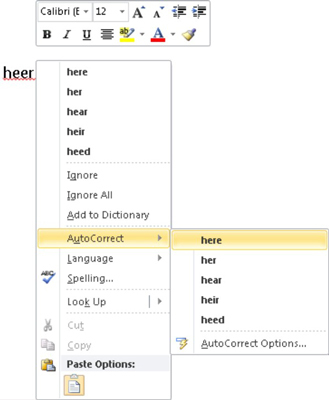 3Choose the properly spelled word from the AutoCorrect submenu. 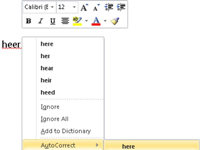 The word is added to the AutoCorrect list, and Word, as a special favor, corrects the word in your text, as well. 4You can reverse AutoCorrect instant changes by pressing Ctrl+Z (the Undo command) immediately after AutoCorrect makes its correction. The change is gone, and a blue rectangle appears under the first letter of the still-corrected word. 5Point the mouse at the rectangle. Various AutoCorrect options appear in a menu. 7Select an option to make the change you want. Selecting Change Back to Whatever undoes the AutoCorrection. 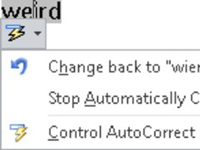 Selecting Stop Automatically Correcting Whatever removes the word from the AutoCorrect dictionary so that it’s not corrected automatically again. (But it may still be flagged as incorrect by the spell checker.) Control AutoCorrect Options displays the AutoCorrect dialog box, which you can use to customize various AutoCorrect settings and to edit or create new entries in the AutoCorrect library.